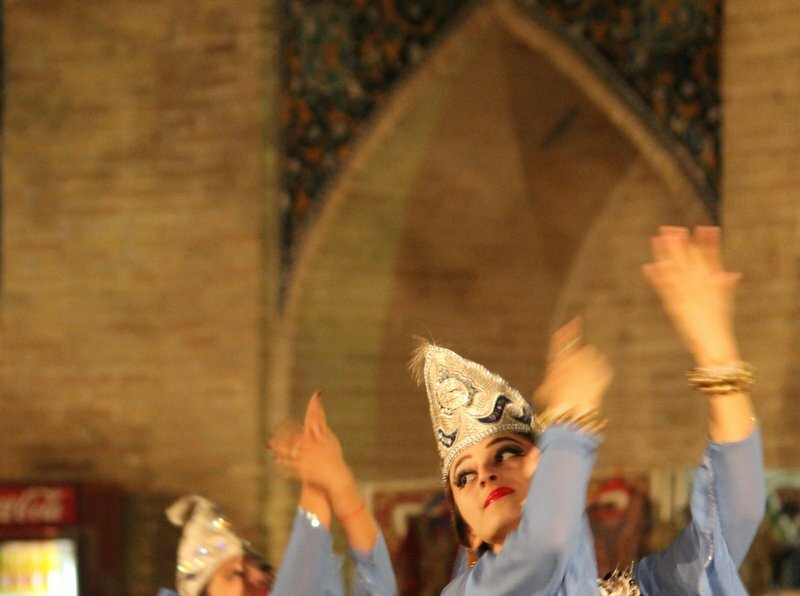 I fell in love in Bukhara. I wasn’t expecting to, but then love is always unexpected, isn’t it? 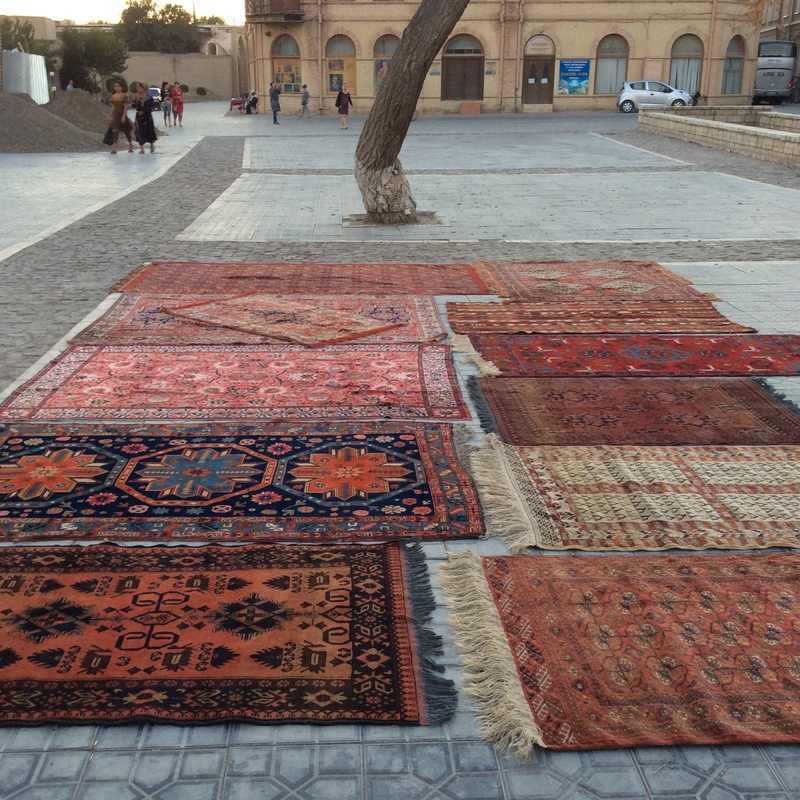 In fact, I wasn’t expecting anything from Bukhara when I visited Uzbekistan in September 2015. 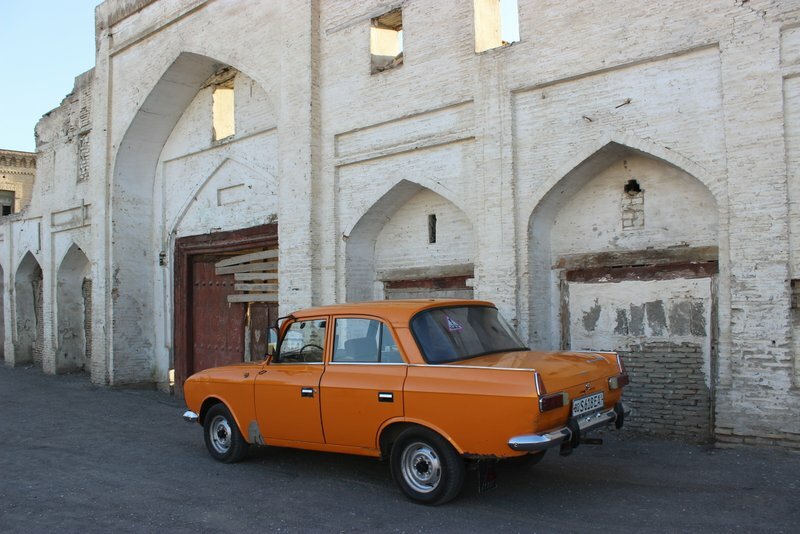 I was too busy dreaming about the Savitsky Museum at Nukus, the blue domes of Samarqand, and the minarets of Khiva. 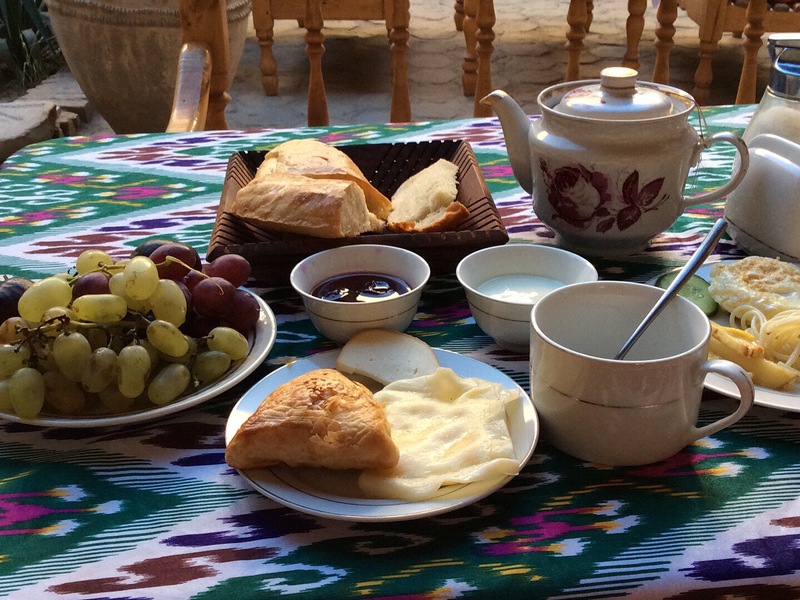 Bukhara was part of my itinerary, but it was more like a pit stop in the 700+ km road distance between Khiva and Samarkand — a place to rest and relax before moving on to the city that had inspired my Uzbekistan trip in the first place — Samarqand. 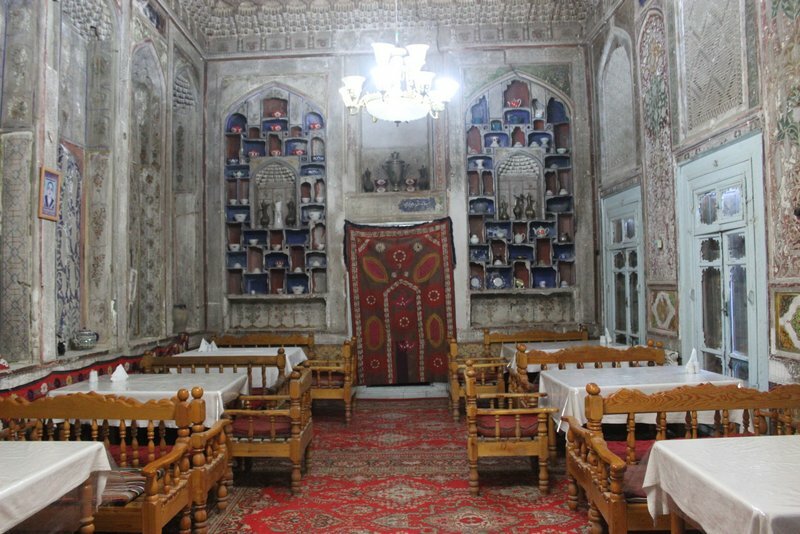 Therefore, my online research for Bukhara only comprised a cursory reading of its history and finalising a B&B to stay. 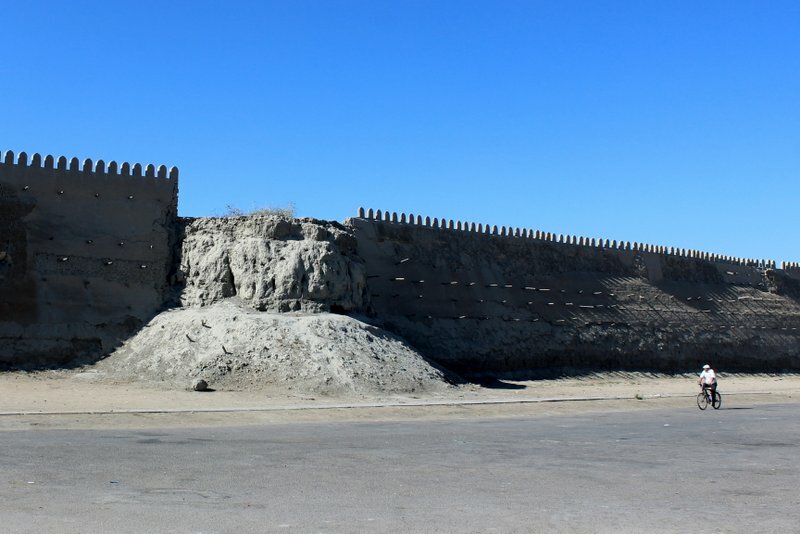 I arrived in Bukhara after a 7-hour drive through the gorgeous Kyzyl Kum Desert from Khiva. 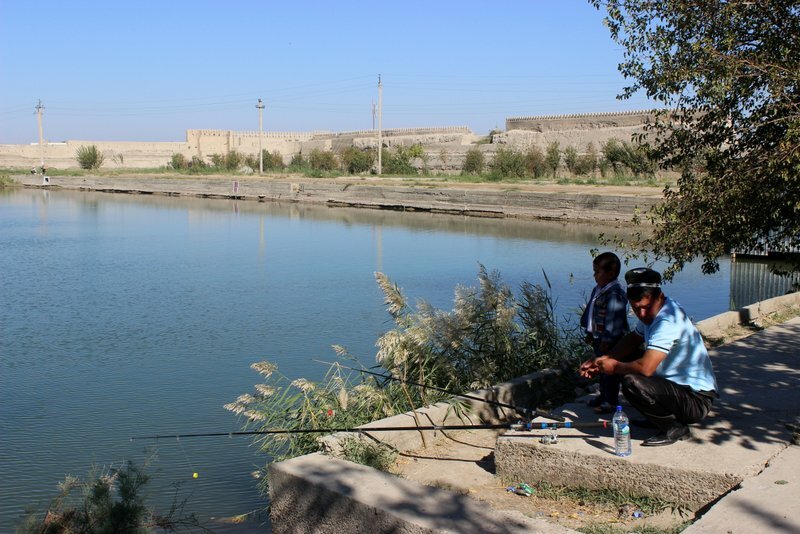 The journey wasn’t particularly tiring as the roads were good for most of the distance, but after seven hours in the car, I just wanted to reach Bukhara. 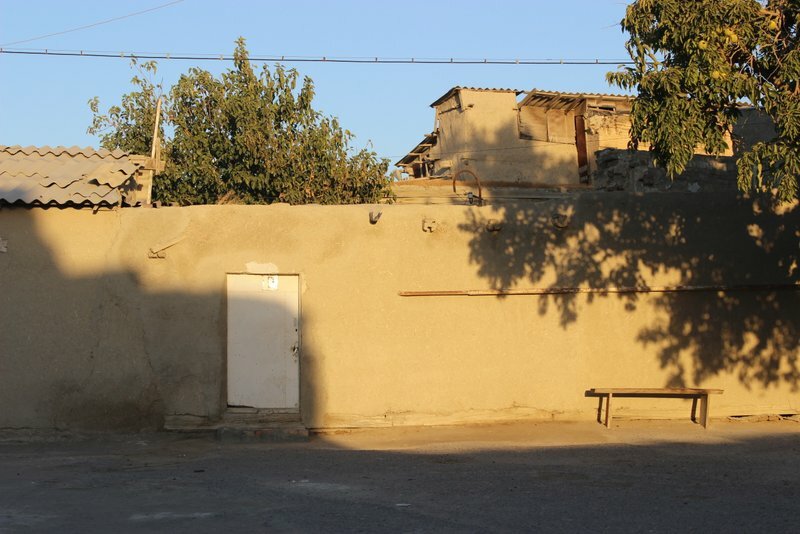 My first impressions of Bukhara were of a clean city with wide tree-lined avenues, multi-storied and traditional buildings existing side by side, and a very different vibe from the cities I had visited in Uzbekistan thus far. 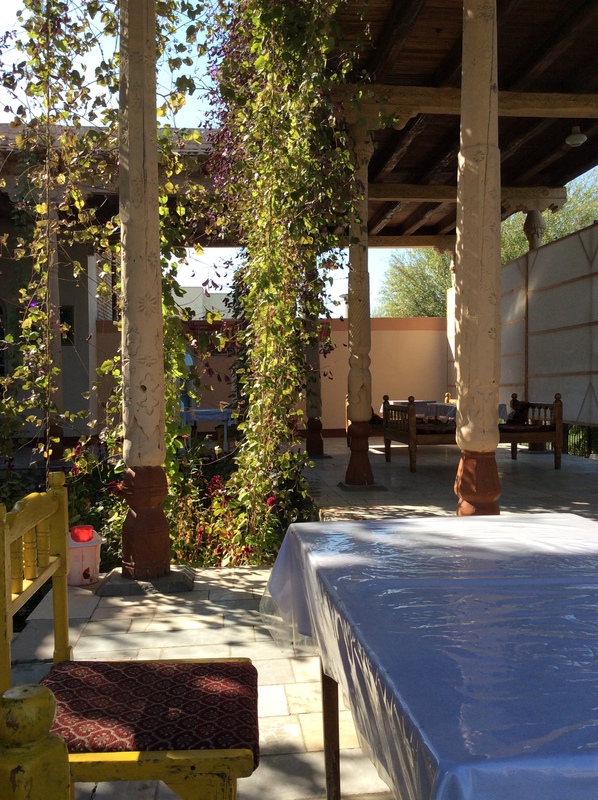 The B&B I was staying in, Rustam & Zukhra, was a charming little place and though I was tempted to rest after the long journey, I thought it best to walk and stretch my legs a bit. Within minutes, I was at the historic Lyabi Hauz Complex and was transfixed by the sight before me. The cool, dappled sunlight and a soft breeze wove its spell on me and I felt all the tiredness just drain out of me thereby setting the tone for my Bukhara visit. 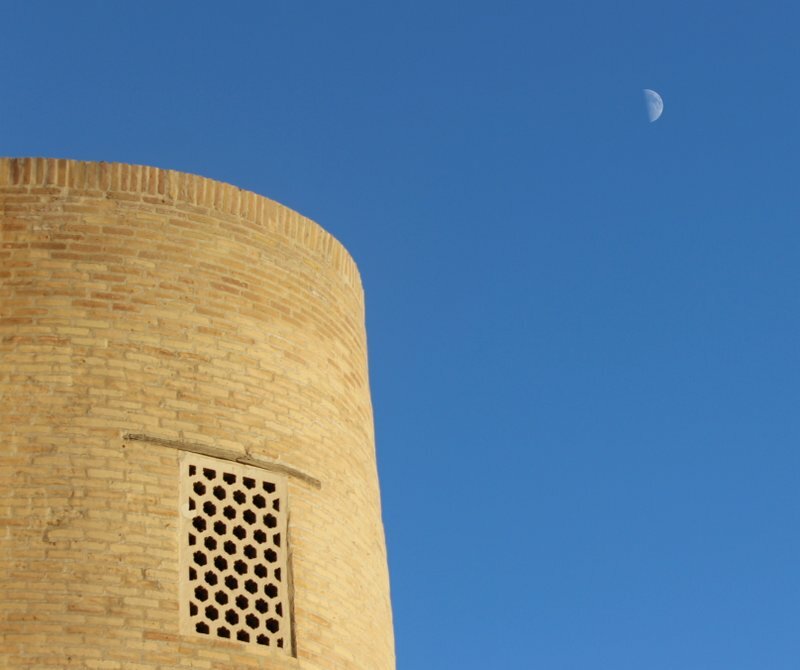 Over the next two-and-a-half days, Bukhara wove its magic on me ever so gently and unobtrusively through its history, monuments, friendly people, markets and its gentle culture. Presenting my ode to Bukhara below. Clicking on any of the photographs will enlarge it and you can then use the left or right arrow keys to navigate through the 25 photographs and their accompanying captions. 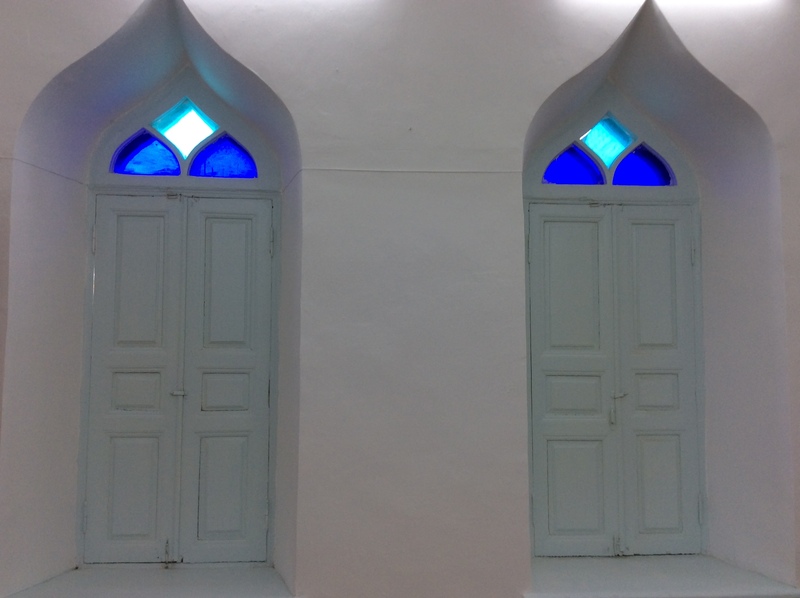 Call for afternoon prayers at the Kalyon Mosque. 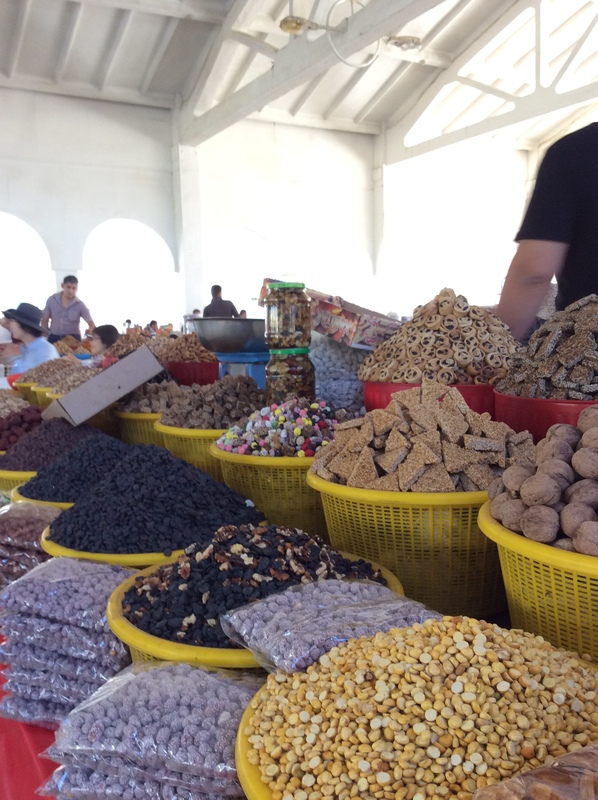 A Choy Khana near the Bakhouddin Nakshbandi Complex. It was early in the morning and unfortunately closed. I would have loved to sip some fragrant tea here. A typical, sumptuous breakfast at Rustam & Zukhra. Storks are considered to be good luck and are not disturbed when they build nests on top of monuments, even if it is a few hundred years old. 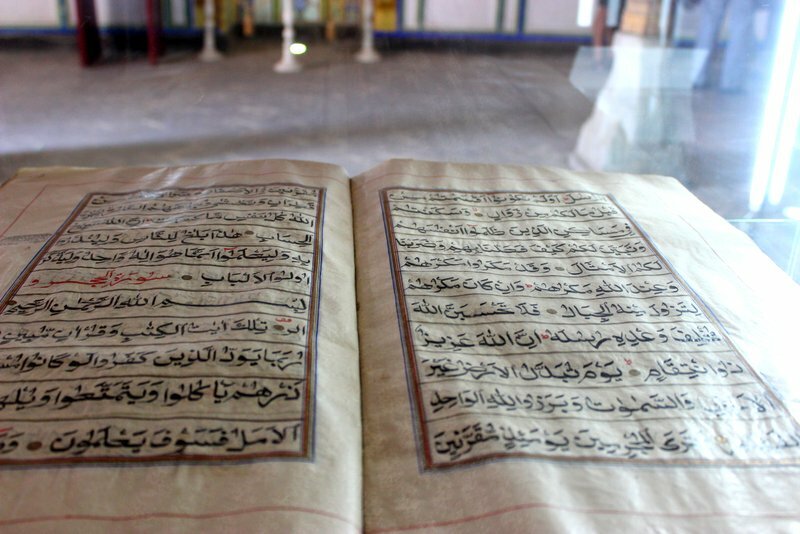 A Qu’ran printed on silk cloth. How could I not photograph this vintage orange car? 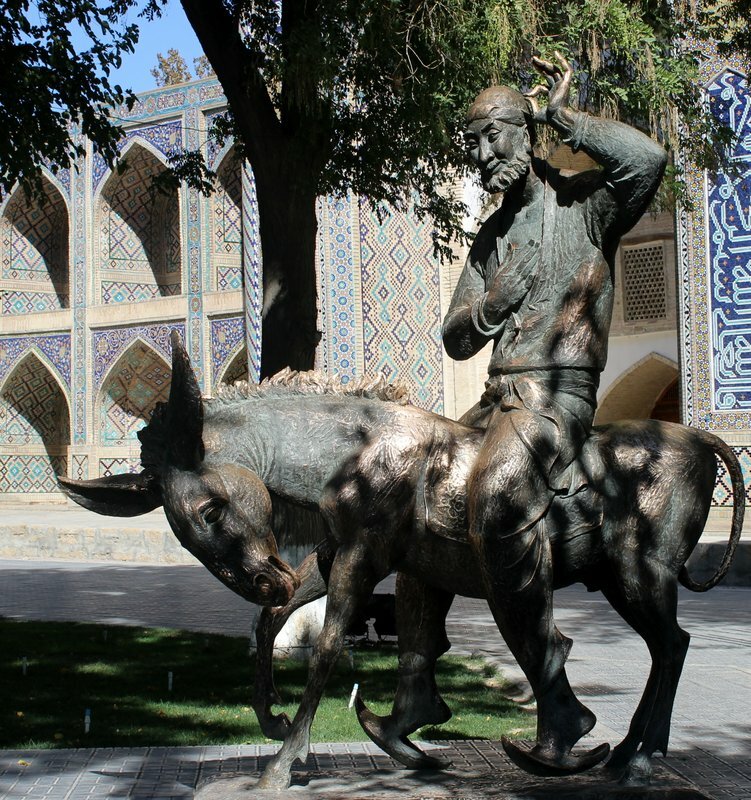 Do you remember the lovable and irascible Mulla Nasruddin Hodja ? And his tales and stories? Well, he is considered to be a son of Bukhara and I was delighted to make his and his donkey’s acquaintance at the Lyabi Hauz complex. 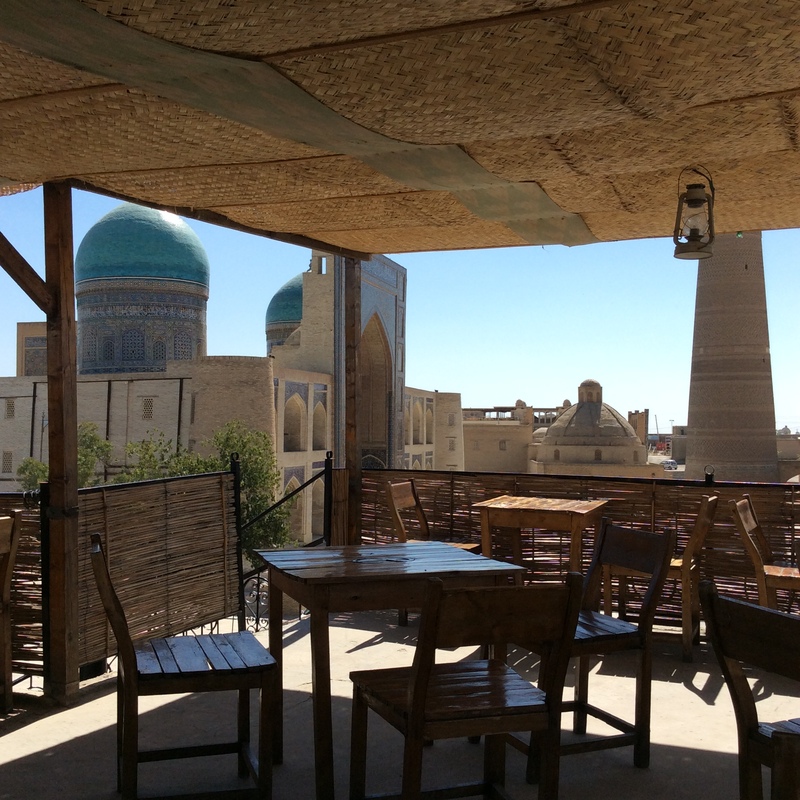 There are so many memories from Bukhara that could not simply not be captured in images, emotion or spirit. So, I will have to make do with words instead. The carpet seller who would say “Salaam India” each time I passed him by. The girl at the café who said her name was Sarah. And then whispered softly that her Indian name was Sunita. Following the aroma of freshly baked bread in the alleyways of Bukhara one evening. I literally sniffed my way to the bakery. The gentle and ever smiling mullahs at the mausoleums and masjids. Zukhra, of Rustam & Zukhra, settling down to watch her daily fix of dubbed Hindi movies. Raj Kapoor’s “Dum dum diga diga” being played for a show to promote Uzbeki textiles. 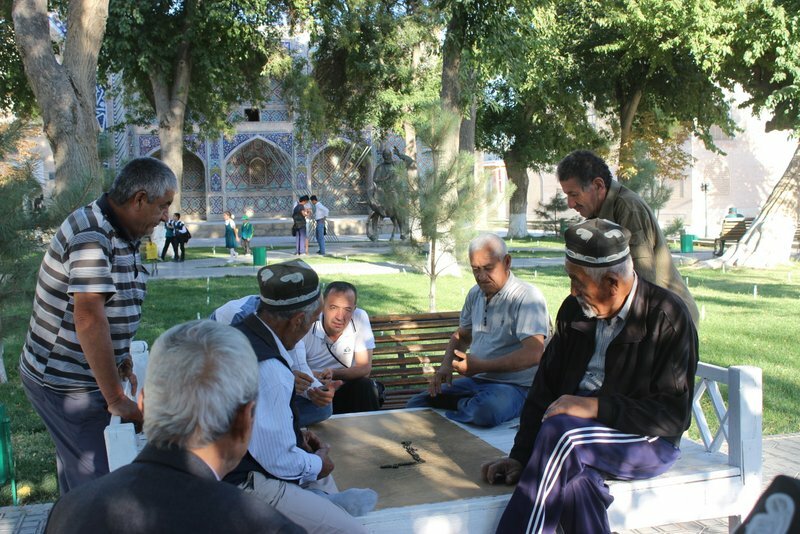 Local Bukharans spending time at the Lyabi Hauz complex and relaxing with family and friends. The aroma of fresh somsas (samosas) and the taste of fresh pumpkin patties. The special spiritual spirit or vibe of the city. 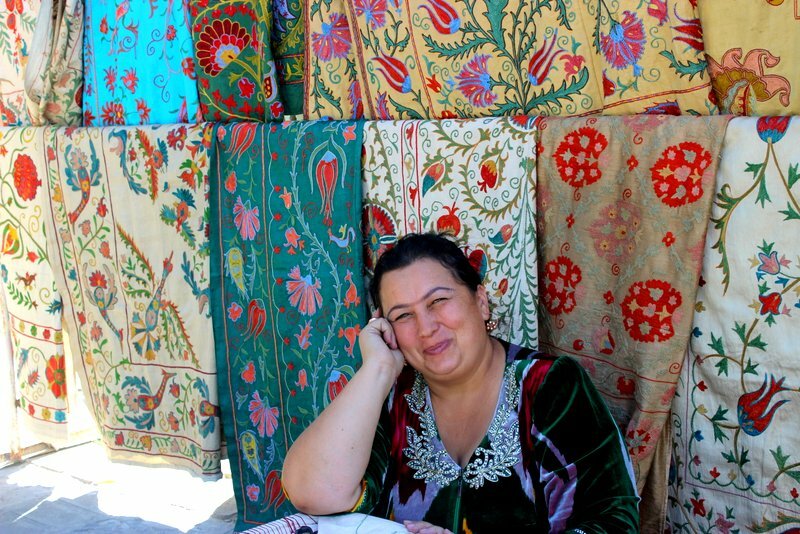 I loved Bukhara, perhaps the most amongst all the places we visited in Uzbekistan. I felt time had stopped there and I’d like to think I was not wrong. I have almost absolutely similar pix of teh people, of the ambience, obviously of the monuments. Lyabi Hauz complex and Poi Lakyan gave me goosebumps then; and again on seeing them here. The Sammanid remains an indelible memory. Thanks for this photographic ode. I remember you telling me of how you loved Bukhara the most. And yet I didn’t pay more attention to it ! 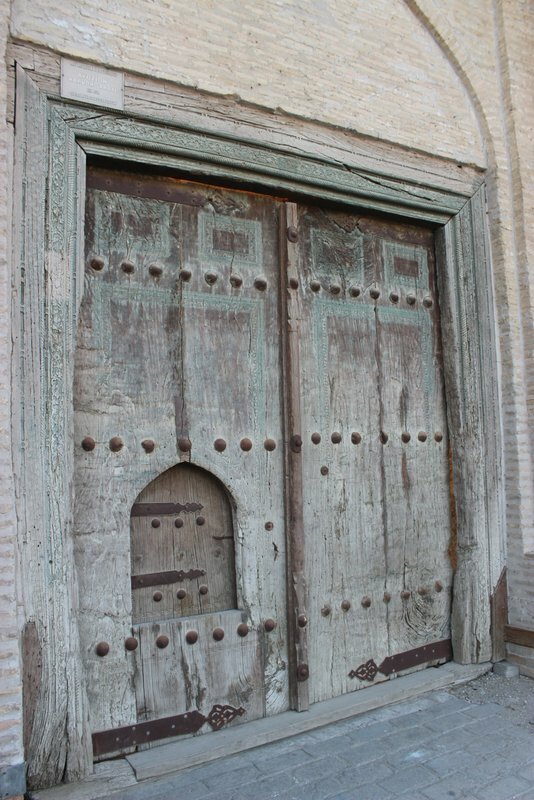 ore than the feeling of time having stopped in Bukhara. I felt that there were various dimensions and visiting each monument just took you to another world. 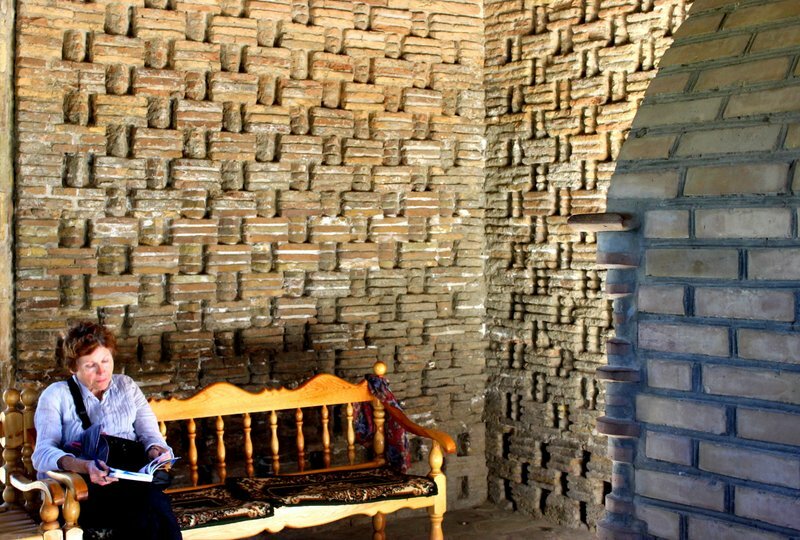 I loved visiting all of them, but the Chor Bakr complex (did you visit it ?) was a little more special. It was so atmospheric ! But more of that in my next post. Thanks for your enchanting memories and beautiful photos. By the way, my father used to have the same vintage old car. It’s called “Moskvich” and you can still see quite a few of them on the streets of Ukraine. What a beautiful place! The pictures are beautiful. Loved Mulla Nasruddin statue and vintage car. How come Sarah had the Indian name Sunita? Need to know more..
As for why Sarah/Sunita? The Uzbeks love Indian films and television and are hooked to it. One of the characters in a Hindi serial is Sunita so Sarah decided to adopt it as her Indian name. Many young girls have an Indian name and learn Bollywood dancing. wow..thats quite a fan following. You need not be a poet for your language is poetic enough, Sudha ji. Your posts are a pleasure to read . 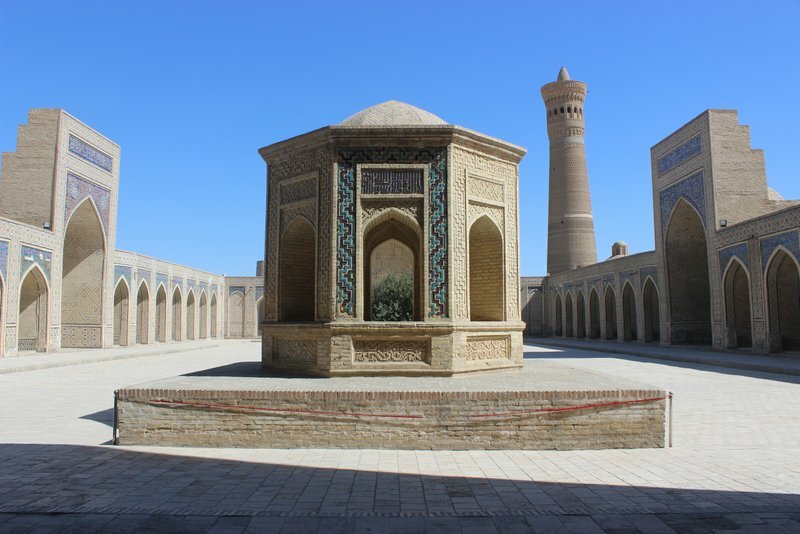 Bukhara on my wish list now along with Khiva and looking forward to Samarkand. Hi Zehra. A warm welcome to “My Favourite Things”. Thank you so much for stopping by and commenting your appreciation. 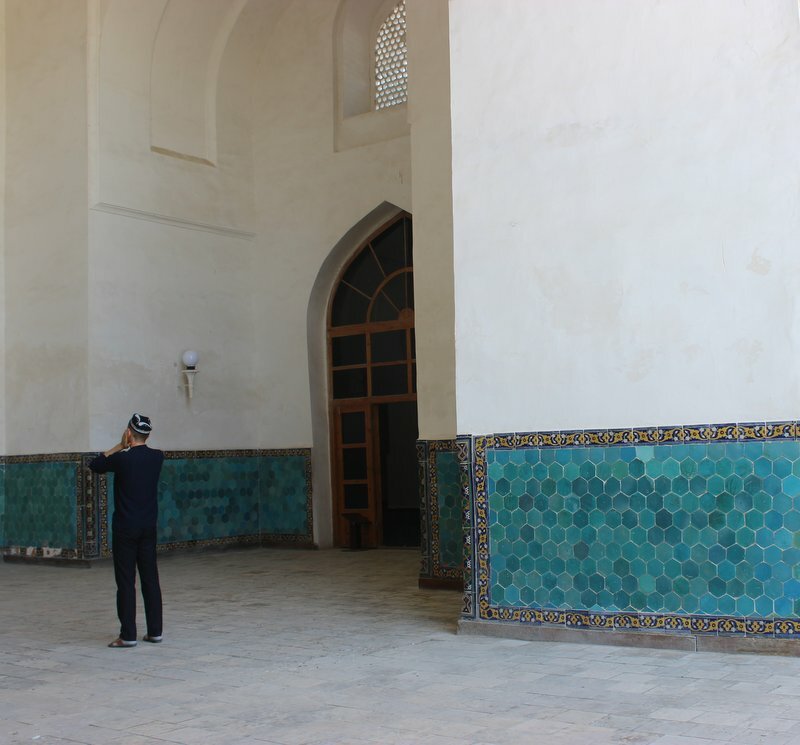 Samarkand is still three posts away – the next two posts are on Bukhara and the third is on Shakhrisabz. fabulous writeup. Loved the Photo story with the wonderfully woven words! Thank you, Quirkywanderer. Very happy that you liked it. Hi Kurush, so nice to see you here. Thank you so much for stopping by and commenting. The intention of my writing these posts is for the purpose of tempting people like you to travel to this wonderful, beautiful country. Calcutta. 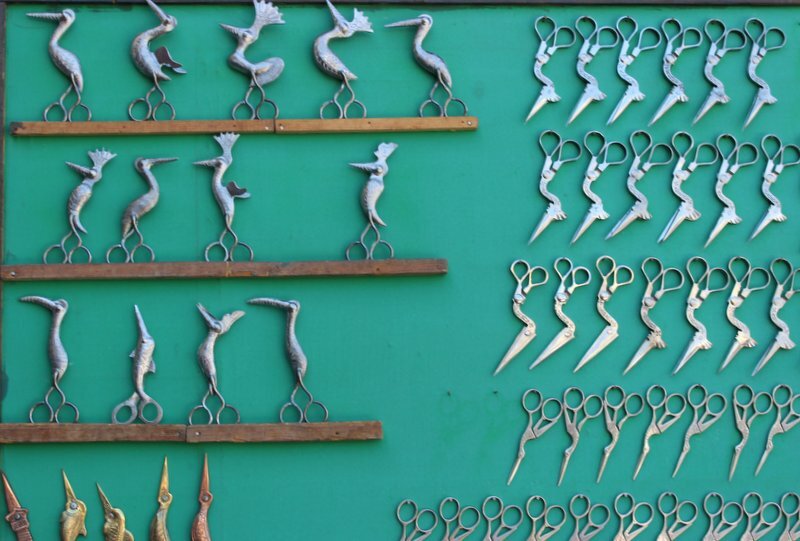 The stork scissors are really cute. 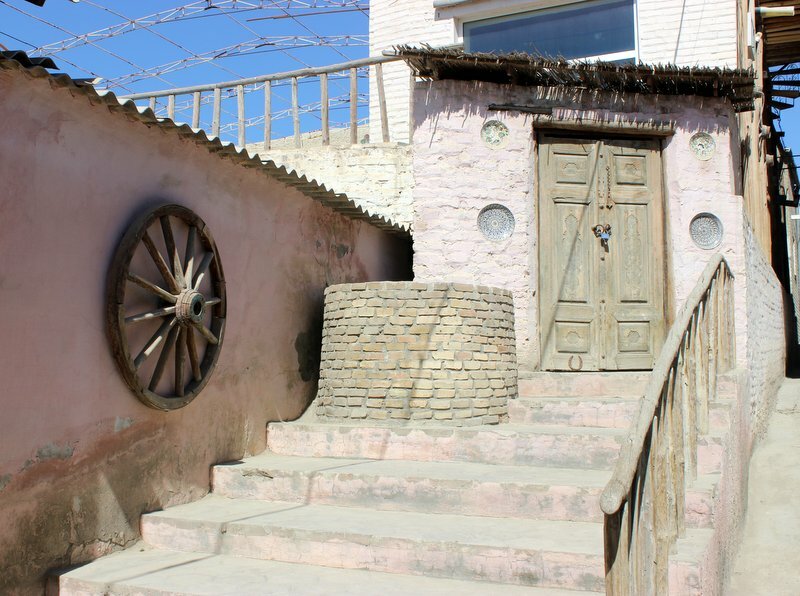 The pink house is so similar to many of our village homes – the bullock cart wheel on the wall. The carpets are gorgeous. Are they made of wool? I nearly fainted when the breakfast was laid out in front of me the first day. “All for me?” I asked. “All for you,” was the beaming reply. I like heavy breakfasts but this was a bit too much. Beautiful and evocative post Sudha. 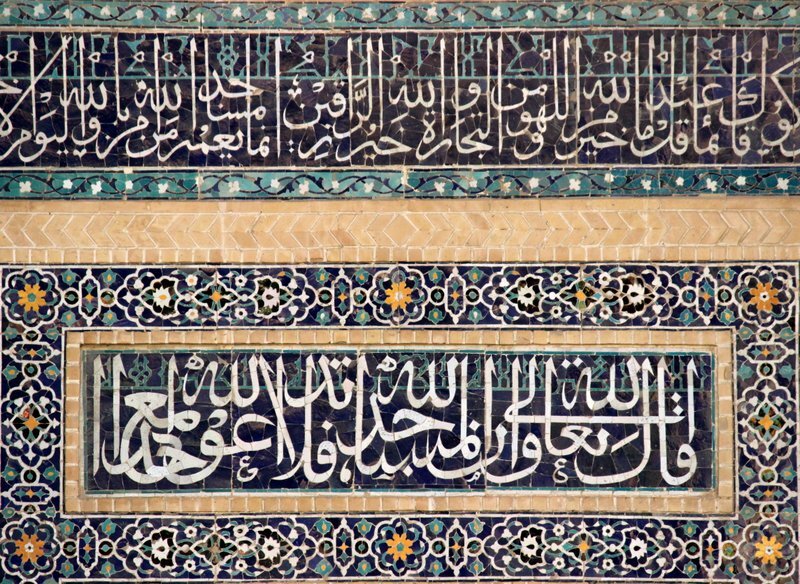 Bukhara sounds like a place I could fall in love with myself Hope to experience it in person someday. 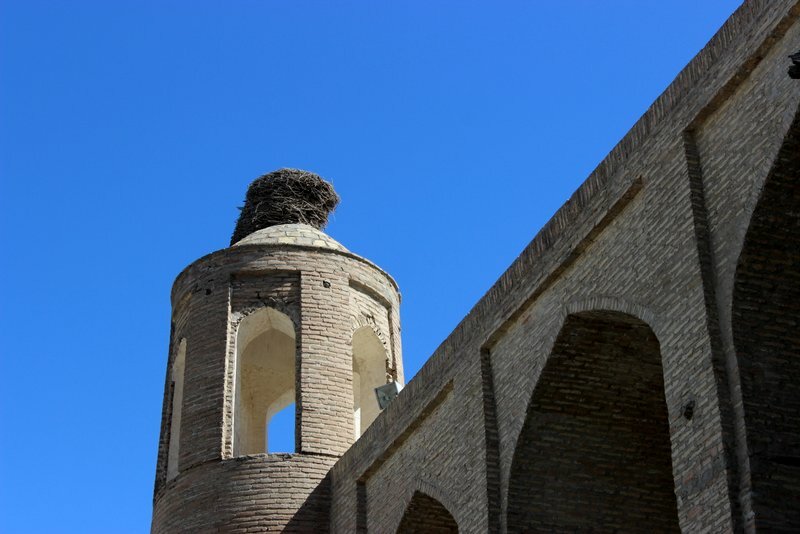 Bukhara is layered and there is so much to see and experience that the mid boggles. I hope that you get to visit Bukhara sooner rather than later. I do tend to leave a bit of myself behind and also carry something of a place I have visited. but none have been so compelling as Bukhara, and Kalpa in the Kinnaur Valley in Himachal Pradesh. Beautiful article. I felt like I was there. Thank you so much, ifish64. That’s the best compliment I could get.